On a trip to London on Friday, I noticed a couple of interesting political things. 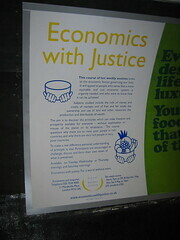 I suppose the range of adverts on the Tube is much wider than anything I am exposed to in Sheffield, but I doubt there are courses on anything like “Economics with Justice” available up here. Perhaps I should look harder, or better still offer some myself. I wonder what they cover. 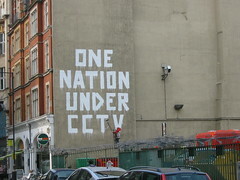 I was amused to see this graffito; I didn’t even notice the surveillance camera next to it until I reviewed my photos at home! What graffiti I have seen in Sheffield—hardly any, to be fair—is largely apolitical.